If you are a fan of the previous films, or just a casual traveler into Middle Earth this film is a must see! 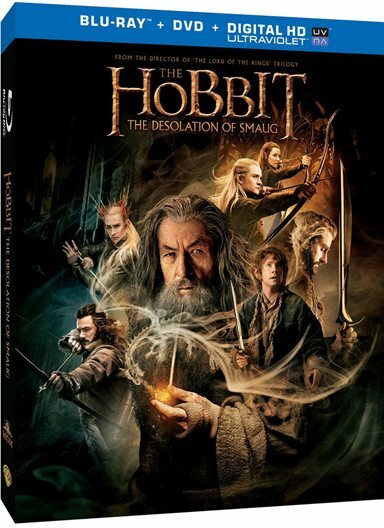 Peter Jackson's "The Hobbit: The Desolation of Smaug" makes its long anticipated debut on the small screen with the release of various home entertainment editions. "The Hobbit", set 60 years before "The Lord of the Rings" trilogy brings us Bilbo Baggins (Martin Freeman), Gandalf (Sir Ian McKellen) and a band of 13 dwarves lead by Thorin Oakenshield (Richard Armitage). The film picks up right where they left off after the first installment of this trilogy, "The Hobbit: An Unexpected Journey". This second adventure has the group being chased and run down by warg-riding orcs, tackling spider attacks and encountering elves before reaching their goal of the Lonely Mountain in an attempt to liberate their home land from the ancient dragon Smaug (voiced by Benedict Cumberbatch). At a packed 161 minutes running time Jackson manages to infuse plot and action iinto the movie with ease and entertainment which keeps you engrossed throughout. While the 2D Blu-ray is always of the highest quality, I recommend watching the 3D version instead. This has to be one of, if not the best, movies I have seen in 3D in a long time. The depth of screen helps to immerse you in Tolkien's world in a way the author most probably never dreamed of. Adding to the overall experience is high quality sound including the haunting melodies of Howard Shore's score. Music Video: "I See Fire" by Ed Sheeran. Download The Hobbit: The Desolation of Smaug from the iTunes Store in Digial HD. For more information about The Hobbit: The Desolation of Smaug visit the FlickDirect Movie Database.